Despite Algiers being currently on the road, filling venues brimful with their firebrand sound and polemic appetite for change, they’re already making plans for next year. 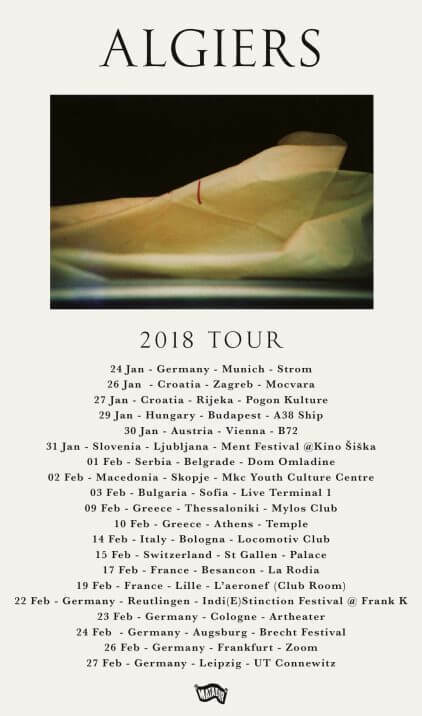 Next year the band will pass across the shadow of the old Iron Curtain, visiting Hungary, Slovenia, Bulgaria and Macedonia ontop of a massive seven dates in Germany, and more shows in Italy, Switzerland and France. Algiers are set to play two dates at the Moth Club in Hackney, London, on the 28th and 29th of November – capping off a hard month of touring across the continent.